London, 1666, and the city is burning. As efforts to contain the fire fail, and most Londoners flee, John Grey, lawyer and sometime-spy heads towards the conflagration, only to stumble across a dead body. Needless to say, the body wasn’t a victim of the smoke or the flames – nope, he was shot in the back. Thankfully, one Robert Hubert confesses not only to the murder but also as being a prime mover in a conspiracy to burn London to the ground on behalf of the French. He claims that he threw a fireball into a bakery in Pudding Lane and that started the conflagration. But something about the story just seems… wrong. Convinced that Hubert is innocent, despite his confession, Grey finds himself betrayed at the highest level. With only the Lady Pole by his side, can he get to the bottom of the plot before the plotters send him to the bottom of the river? The fourth book in the John Grey series – following A Cruel Necessity, A Masterpiece of Corruption and The Plague Road – and we find Grey now doubting his paymasters (not that they pay him very often). Did someone from the heart of government really burn London to foster fear against the French? Whatever happened, it’s going to be fun finding out. 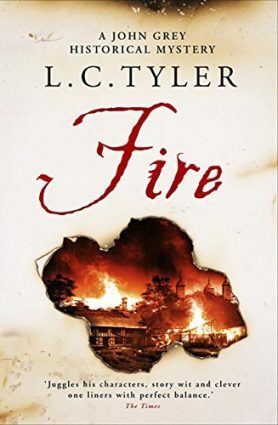 It can’t be easy, writing about a historical conspiracy and a real life event while still keeping a light tone, but L C Tyler succeeds, yet again, with aplomb. There are moments that made me laugh out loud and moments that had me on the edge of my seat. And there are fascinating snippets of history – I’ve not read anything about what happened to Londoners in the aftermath, or who was blamed for the disaster, and I found this just as intriguing. One caveat for fans of the classic mystery – there isn’t really much of one here, as the ringleader of the plot was pretty obvious to me. But the ins and outs of the conspiracy and Grey’s adventures as he struggles to find the truth kept me gripped from beginning to end, the banter between him and Lady Pole being one of the main highlights. Very different from Tyler’s Ethelred and Elsie series, but just as entertaining. Many thanks to Len for the review copy, this is Highly Recommended.